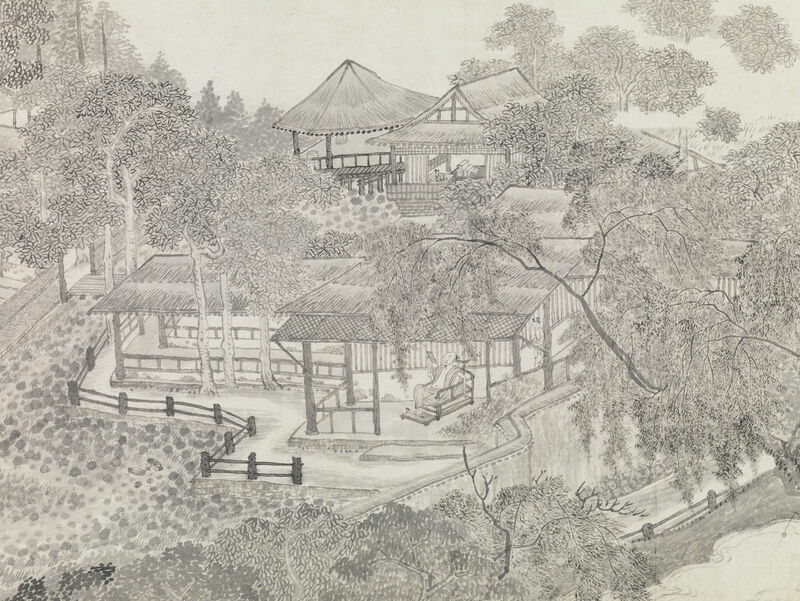 Wu Li 吳歷 (1632–1718), 清 吳歷 墨井草堂消夏圖 卷 Whiling Away the Summer (detail) (1679), ink on paper scroll, 36.4 x 268.6 cm, Metropolitan Museum of Art, New York, NY. Wikimedia Commons. 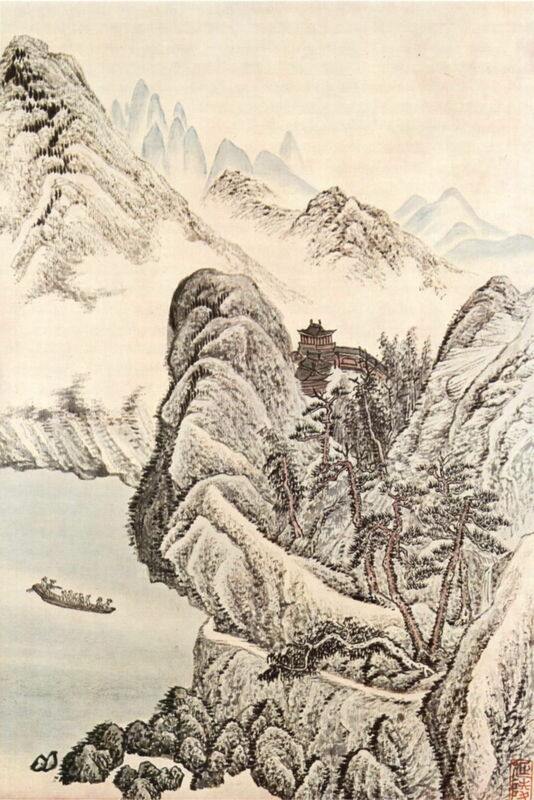 Many of the books on Chinese landscape painting, and visual art in general, stop short at the end of the Ming dynasty in 1644. If they cover any work after that time, it is patchy and sporadic compared to their much denser coverage up to the fall of Beijing in that year. The subsequent dynasty, the Qing, lasted until 1912, and saw dramatic changes in painting. Most authors dismiss them as resulting in repetitive, formulaic works which were stifled by the straitjacket of convention. In the early years, though, several artists achieved distinctive styles: in particular, the Six Masters of the early Qing. Among them was Wú Lì 吳歷 吴历, who had been born in 1632, well before the collapse of the Ming, and who died on 24 February 1718 or thereabouts – three centuries ago today. In this article, I trace Wú’s life, and show a few of his surviving works. In tomorrow’s article, I show some of the better examples of the work of the other five of the Six Masters. Wú learned to paint with two of the other Six Masters, and learned poetry too. He seems to have been particularly productive in the years up to 1681, during which he made the following works. 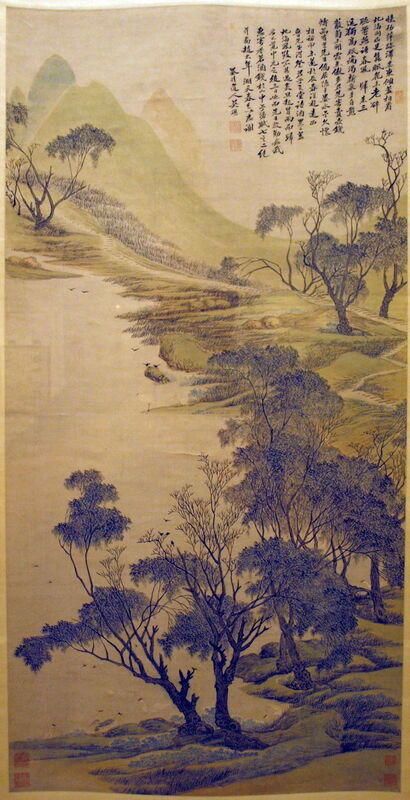 Wú Lì 吳歷 (1632–1718), Spring Comes to the Lake (1676), ink and colour on silk hanging scroll, 123.8 × 62.5 cm, Shanghai Museum, Shanghai, China. Image by Captmondo, via Wikimedia Commons. Spring Comes to the Lake (1676), like most of Wú’s paintings, is accompanied by what I suspect is the artist’s own poetry. It shows a lake, at the foot of some grassy hills, as the birds become more active, and the trees come into bud for the Spring. Simple pale greens show the rounded forms of the land, with rhythmic details of the plants and fine features like the path, which rises across the upper section of the scroll. In the summer of 1679, one clear morning after rain, Wú was sitting alone in his studio, when he envisaged the panorama which he then painted in Whiling Away the Summer. This is thought to have been inspired by one of Wú’s favourite painters, Huang Gongwang (1269–1354), but is expressed in his own distinctive style, using intricate patterns of pale ink textures built in gentle cadence. The following three images show its sections from right to left. Overall, its landscape is a dream surrounding a scholar, who sits alone, absorbed in his reading, as shown in this detail of the middle of the scroll. 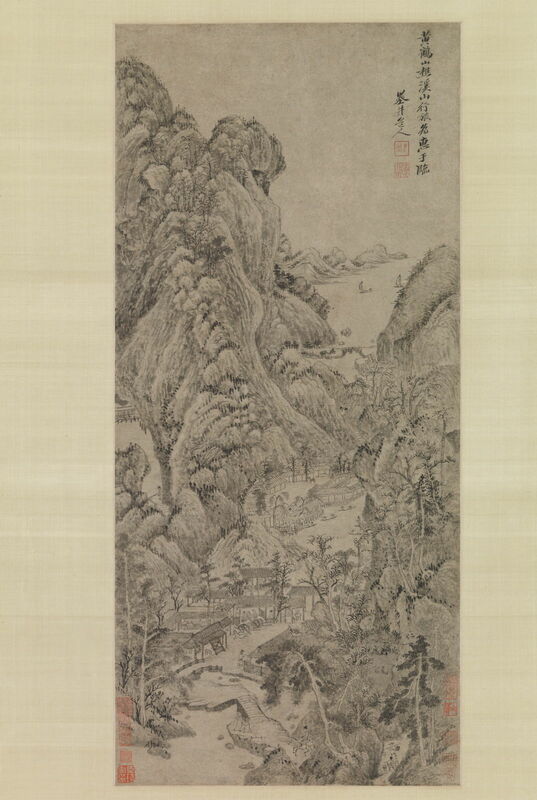 Wu Li 吳歷 (1632–1718), 仿關仝山水 Boat Trip on the River Below a Buddhist Temple (1660-1710), ink and colour on paper, 39.7 × 26.8 cm, National Palace Museum 國立故宮博物院, Taipei, Taiwan. Wikimedia Commons. Much of the colour has sadly faded from Wú’s Boat Trip on the River Below a Buddhist Temple. 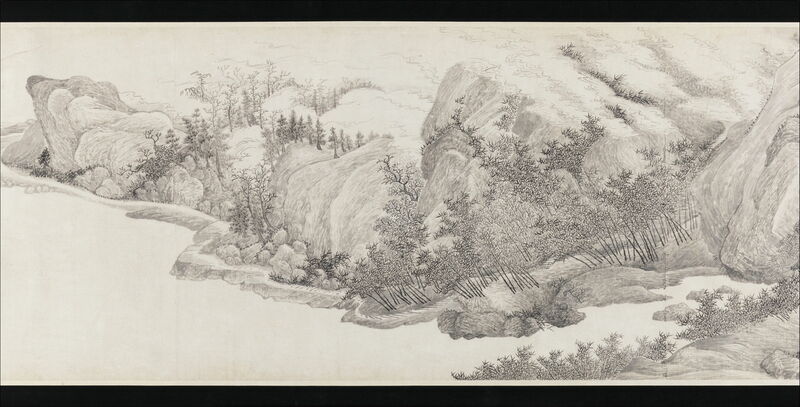 Wu Li 吳歷 (1632–1718), 清 吳歷 倣王蒙溪山行旅圖 軸 Travellers Among Streams and Mountains (date not known), ink on paper scroll, 59.1 x 27 cm, Metropolitan Museum of Art, New York, NY. Wikimedia Commons. Wú’s undated painting of Travellers Among Streams and Mountains contains more passages with close cadences of soft brushstrokes, for example in the dark trees adorning the ridges. 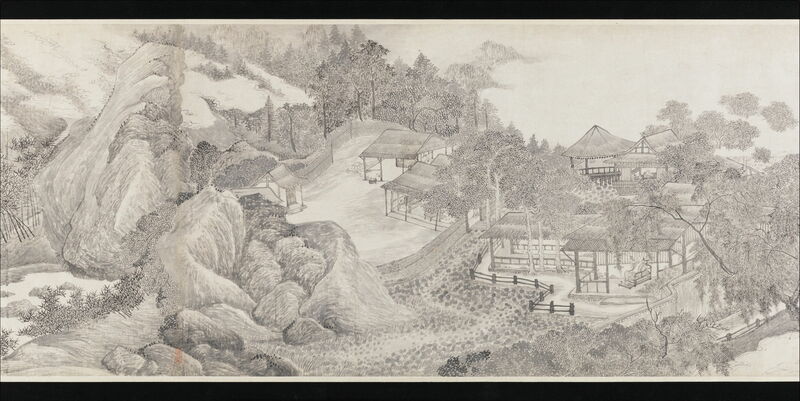 Wu Li 吳歷 (1632–1718), 雲白山青 White Cloud, Green Mountain (date not known), ink and colour on scroll, 25.9 x 117.2 cm, National Palace Museum 國立故宮博物院, Taipei, Taiwan. Wikimedia Commons. Wú’s colours have survived much better in his undated White Cloud, Green Mountain, where the trees form into a dragon-like structure which curls over the foothills. The contrast between those trees and the softer forms of the hills is impressive, as are the birds at the upper left. In middle age, Wú switched his allegiance from being the close friend of a monk in the Xing Fu Buddhist monastery, to two Jesuit missionaries and their Catholic community. In 1681, he was baptised, and later that year travelled to Macau with one of the missionaries, intending to go on to Europe. Wú returned to his studio in 1682, but with the death of his wife and his Masters he returned to Macau to learn Latin and train as a Jesuit priest. Wú was ordained in 1688, and the following year started work as a missionary in the country around Shanghai. For thirty years he travelled from village to village preaching his faith. He continued to write poetry, and seems to have painted as well, although I have not been able to locate any of his works which are dated to those later years in his career. He died in Shanghai at the age of 86, on (about) 24 February 1718. What an extraordinary life, and such beautiful paintings. Posted in General, Life, Painting and tagged Chinese, landscape, Li, painting, Qing, Six Master, Wu. Bookmark the permalink.